Bitnar P, Stovicek J, Andel R, Arlt J, Arltova M, Smejkal M, Kolar P, Kobesova A.
Cakrt O, Chovanec M, Funda T, Kalitova P, Betka J, Zverina E, Kolar P, Jerabek J. Exercise with visual feedback improves postural stability after vestibular schwannoma surgery, Eur Arch Otorhinolaryngol, 2010 Sep;267(9):1355-60. Cakrt O, Slaby K, Viktorinova L, Kolar P, Jerabek J.
Subjective visual vertical in patients with idiopatic scoliosis, J Vestib Res, 2011;21(3):161-5. Casas E, Justes A, Calvo C.
Frank C, Kobesova A, Kolar P.
Horacek O, Chlumsky J, Mazanec R, Kolar P, Andel R, Kobesova A. Pulmonary function in patients with hereditary motor and sensory neuropathy: A comparison of patients with and without spinal deformity, Neuromuscul Disord. , 2012 Dec;22(12):1083-9. Horacek O, Mazanec R, Morris CE, Kobesova A.
Spinal deformities in hereditary motor and sensory neuropathy: a retrospective qualitative, quantitative, genotypical, and familial analysis of 175 patients., Spine, 2007;32(22):2502-8. Kobesova A, Drdakova L, Andel R, Kolar P.
Kobesova A, Dzvonik J, Kolar P, Sardina A, Andel R.
Kobesova A, Kolar P, Mlckova J, Svehlik M, Morris CE, Frank C, Lepsikova M, Kozak J. Effect of functional stabilization training on balance and motor patterns in a patient with Charcot-Marie-Tooth disease, Neuro Endocrinol Lett, 2012;33(1):3-10. Developmental Kinesiology: Three Levels of Motor Control i the Assessment and Treatment of the Motor System. , Journal of Bodywork and Movement Therapies., 2014;18(1):23-33. Kobesova A, Morris CE, Lewit K,Safarova M.
Kobesova A, Nyvltova M, Kraus J, Kolar P, Sardina A, Mazanec R, Andel R.
The Prague School of Rehabilitation, International Musculoskeletal Medicine, 2012;34(2):39-41. Kolar P, Neuwirth J, Sanda J, Suchanek V, Svata Z, Volejnik J, Pivec M.
Analysis of Diaphragm Movement during Tidal Breathing and during its Activation while Breath Holding Using MRI Synchronized with Spirometry , Physiol Res, 2009;58(3):383-92. Postural Function of the Diaphragm in Persons With and Without Chronic Low Back Pain. , J Orthop Sports Phys Ther, 2012;42:352-362, Full text displayed with permission of the Journal of Orthopaedic and Sports Physical Therapy, and the Sports Physical Therapy Section and the Orthopaedic Section of the American Physical Therapy Association. Importance of Developmental Kinesiology for Manual Medicine, translated from Czech Journal of Rehabilitation and Physical Therapy, 1996;4:139-143. Surgical treatment and motor development in patients suffering from cerebral palsy, Translated from Czech Journal of Rehabilitation and Physical Therapy, 2001;8(4):165-168. Kozak J, Kobesova A, Vrba I, Steindler J, Kolar P.
Peripheral Nerve Stimulation in Intractable Neuropathic Pain: A Case Report, Neuro Endocrinol Lett, 2001 Jun 3;32(3):226-233. Kutilek P, Socha V, Cakrt O, Svoboda Z.
Lewit K, Kobesova A, Lepsikova M.
Morris CE, Greeman PE, Bullock MI, Basmajian JV, Kobesova A.
Oppelt M,Juehring D,Sorgenfrey G, Harvey PJ, Larkin-Thier SM. A case study utilizing spinal manipulation and dynamic neuromuscular stabilization care to enhance function of a post cerebrovascular accident patient, Journal of Bodywork and Movement Therapies., 2014;18:17-22. Son M.S., You J.H., Yi Ch.H., Jeon H.S., Ca Y.J. Suchánek O, Podrazil M, Fischerová B, Bočínská H, Budínský V, Stejskal D, Spíšek R, Bartůňková J, Kolář P.
Intensive physical activity increases peripheral blood dendritic cells , Cell Immunol. , 2010;266(1):40-5. Svehlik M, Slaby K, Soumar L, Smetana P, Kobesova A, Trc T.
Kobesova A, Kolar P Nørgaard I.
Kobesova A, Safarova M, Kolar P.
Dynamic Neuromuscular Stabilization: Exercises Based on Developmental Kinesiology Models, Functional Training Handbook, Wolters & Kluwer, 2014: 25-51. , 13:978-1-58255-920-9. Soft Tissue Manipulation , Rehabilitation of the Spine. A Practitioner’s Manual. 2nd ed, Lippincott Williams&Wilkins. 2006:388-402, 0-7817-2997-1. Safarova M, Kobesova A, Kolar P.
Bitnar P, Kolar P, et al. 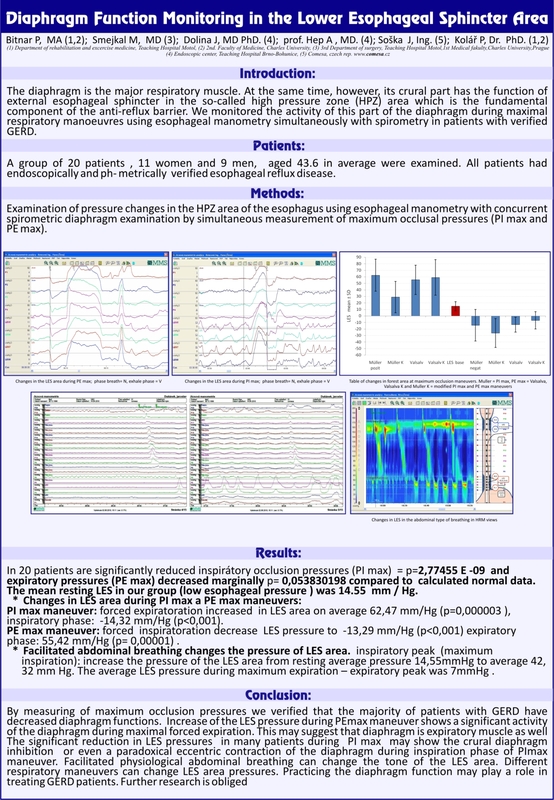 Diaphragm function in GERD patients: PFT assessment with extended esophageal manometry , ERS Congress Barcelona, 20th Congress of European Respiratory Society, Barcelona,Spain 2010. The importance of the diaphragm in the etiology and the possibility of its use in the treatment of GERD. , The International Society for Diseases of the Esophagus, Biennial Congress in Kagoshima September 2-5, 2010, Kagoshima – Japan. Long-Term Efficacy of Dynamic Neuromuscular Stabilization in Treatment of Chronic Musculoskeletal Pain, 12th World Congress on Pain. Glasgow, Scotland. Aug 17-22, 2008. Presentation # PF225. DNS Interview Ken Crenshaw, ATC of AZ Diamondbacks (MLB). Interview with Clare Frank and Craig Liebenson Feb. 8th 2010. Kobesova A, Oplova L, Gerzova E, Kolar P.